6 Best Inflatable Kayak Reviews (2019) | Is Coleman #1? 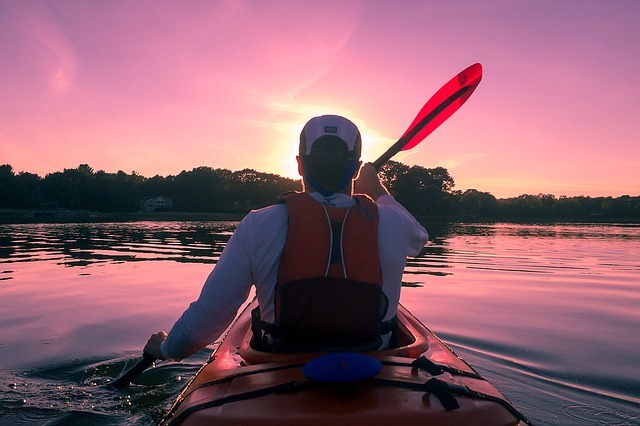 Over the last decade, improvements in the designs of inflatable kayaks have made them strong contenders among their polyethylene and fiberglass counterparts. Some of the inflatable kayaks give hardshell kayaks a run for their money when competing with whitewater racing and sports. Inflatable touring kayaks guide straighter and faster than ever before. This post will outline the 6 best inflatable kayaks of 2019. Inflatable kayaks hold a distinct advantage over hardshell kayaks. They deflate to a small size and are easier to transport than hardshell boats. They are a favorite for backpackers who can tote them along with little effort. Polyethylene is a durable, hard plastic and it’s a viable material for manufacturing kayaks. Poly kayaks sail with stability on rivers, ponds, and lakes. They don’t fare so well in open water or in heavy winds or currents. Most poly kayaks have a small storage area for short day trips. Touring kayaks have a slender design that is perfect for longer trips. Touring kayaks have a larger storage area. The downside to poly kayaks is that they are heavy and hard to carry out to the water. You definitely want to use polethylene kayaks as fishing kayaks though. Today’s inflatable kayaks are more than a blow-up water toy. They won’t hold up to strong winds or currents either, but they are durable and portable. Inflate them easily with a foot or hand pump. Inflatable kayaks range in length from 10-15 ft. long. Deflate them down to a duffel bag size for easy storage and transport. They’re a little harder to paddle than a hardshell boat and they can be difficult to bail out if they get flipped. Inflatables won’t track as straight as a hardshell kayak, but they are light and can turn on a dime. Fortunately you can use a side cart with both of them, but if the waters are rough then it may make it difficult if you are using an inflatable kayak. The cockpit of this inflatable kayak is designed for space and comfort. It’s made of durable welded material with visible graphics for added safety. It has a cargo net to for storing gear and it has a handy grab line on both ends. Relax on the inflatable seat with supportive backrest. It comes with an 84” aluminum oar, hand pump, and patch. Other boaters are sure to see you in this bright yellow kayak with sporty graphics. It’s a good 2-person inflatable vessel for use in lakes and mild rivers. It has inflatable seats with backrests that are adjustable. It also has a removable skeg for directional stability. It’s lightweight and compact and pumps up in short order. It will be a great day of kayaking for two. Sea Eagle thought of everything with this inflatable kayak that inflates in just 8 minutes. It’s NMMA certified and has a self-bailing drain valve with 3 deluxe one-way valves. It has lashed-down inflatable spray skirts. You’ll love the portability of this boat—it weighs just 32 pounds. It can handle whitewater up to class III. Spend more time kayaking after inflating this kayak in only 5 minutes. It’s a versatile kayak system where the seat turns into a handy backpack. It is made with 21-guage PVC construction so it’s rugged enough for lake use. It has a tarpaulin bottom that resists punctures. It has an Airtight System that is guaranteed not to leak. This extra-large kayak holds three adults. It has multiple chambers, so if one of the chambers is punctured, you still have air. Fill it up quickly with the Boston Valve that is double-threaded to blow up and deflate with ease. The seats adjust to fit leg room and the spray covers block splashes to keep you dry. At only 25 pounds, this inflatable kayak is lightweight and portable. Just deflated and pack it in the handy back pack. It’s a full 9’ x 30.25” and comes with a high-pressure valve and foot pump. It has a puncture-resistant triple-layer of PVC that makes it feel like a hardshell kayak when it’s inflated. It comes with an 87” lightweight rotatable paddle, an inflatable seat and 2 fins for directional stability and maneuverability. Unless you are racing or doing competitive kayaking, inflatable kayaks are a durable alternative to a hardshell kayak. Advancements in manufacturing and materials give you many of the benefits of the harder material boats with the added benefit of being lighter and easier to store and transport. To ensure safe sailing, choose your waters carefully and be sure to check the weather conditions. Kayaks can tip easily, so don’t go out without a life jacket.